Last year (2008) the Scottish National Portrait Gallery’s best-known and treasured portrait of Bonnie Prince Charlie was claimed instead to be a portrait of his younger brother, Henry Stuart, Duke of York, who later became a Cardinal and wished to be known as ‘King Henry IX’ of Britain. The pastel by Maurice Quentin de La Tour was acquired by the Gallery in 1994 for £22,000 and has been celebrated as such ever since. But then in 2008 Bendor Grosvenor, a director of the London portrait dealers Philip Mould Ltd, made his startling claim in The British Art Journal that the portrait does not show Charles but rather his brother, Henry Stuart, when he was Duke of York and before he was made a Cardinal. At the time, the Scottish National Portrait Gallery dismissed the claim, partly because the expert on Jacobite portraiture, Dr Edward Corp of the University of Toulouse, France, had published the portrait as an authentic image of Bonnie Prince Charlie, in the standard work on the subject, The King over the Water: Portraits of the Stuarts in Exile after 1689, published by the National Galleries of Scotland in 2001. Now Dr Corp has reversed his opinion in an article in The British Art Journal (Vol X, No. 3). The portrait is definitely not of Bonnie Prince Charlie, he has concluded, but indeed of Cardinal Henry Stuart. ‘Whether the portrait does or does not show Prince Charles really does matter,’ says Dr Corp.
bottle dated 1753 now in the Fitzwilliam Museum, Cambridge (above right). 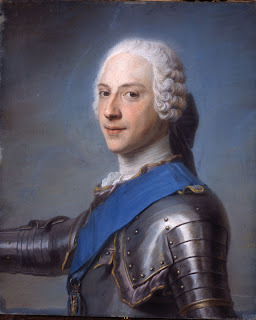 The mystery is how the La Tour pastel in the Scottish National Portrait Gallery first became known as a likeness of Bonnie Prince Charlie. One red herring was the fact that the sitter was wearing armour, which was thought to be at odds with Henry’s religious vocation. Furthermore, Charles was known to have sat to La Tour in 1747, upon his return to Paris after the failure of the 1745 Rebellion. However, Bendor Grosvenor was able to discover that Henry also sat to La Tour at some point between late 1745 and, crucially, before his creation as a cardinal by his godfather the Pope, Benedict XIV, in June 1747. Therefore, Henry’s depiction in armour was appropriate, for between 1745-6 he was in charge of a naval expedition to assist Charles’ rebellion in Scotland. Moreover, the portrait of Henry was exhibited at the Paris Salon in 1747. The WINNER of the William MB Berger Prize for British Art History 2008 (books published 1 September 2007-31 August 2008) was announced at a reception hosted by Robin Simon, Editor of The British Art Journal, at the Paul Mellon Centre for Studies in British Art on 2 July 2009.
thinking about British art for many years, and here are the fruits of his considerable and profound experience. often startling conjunctions, and ranged right through, convincingly, to the late twentieth century. aware of contemporary European developments but yet trapped within a distinct aesthetic and cultural world. Anthony Van Dyck’s dazzling pictures reflect the glitz and glamour of the most sophisticated court this country has ever seen. He transformed portrait painting in Britain from the moment of his arrival in as a precocious twenty-one-year-old in 1620. As this exhibition shows, his example continued to shape portraiture in Britain until well into the twentieth century. Van Dyck flourished under Charles I and did more than anyone to foster a doomed society’s outrageously lavish vision of itself. He himself was dead, in 1641, before tragedy struck, but in 1649 with the execution of the King, the world that Van Dyck had done so much to create vanished as if it had never existed. While it lasted, London was a great place for a portrait painter to be. In order to cut the right figure and curry favour, courtiers had to emulate Charles I’s passion for art collecting and patronage. Immense collections were built up overnight, stuffed with masterpieces by Titian or Raphael, while portraits and spectacular party pieces were commissioned from living masters, especially Rubens and his star pupil Van Dyck. The exhibition includes two vast paintings from the Royal Collection. One is ‘The Greate Peece’, a portrait group of Charles, his queen Henrietta Maria and their two eldest children, set in front of a view of the Thames and Westminster. Van Dyck manages his gigantic canvas with apparent ease. The children are painted with extraordinary tenderness, and the picture brilliantly combines, as was intended, majestic scale with a vision of domestic harmony. 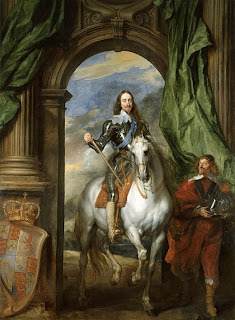 In the same room is Charles I on horseback with M de St Antoine, specifically designed to be seen as a ‘hole in the wall’ at the end of the gallery in St James’s Palace. It is another triumphant combination, this time of portrait painting with full-blown baroque theatricality. A much more intimate portrait is of Van Dyck’s mistress, Margaret Lemon, a rarely seen jewel. She was a ‘demon of jealousy’ who resented her lover painting other women and tried to bite his thumb off to end his career. Fortunately for Charles I and his court, and for us, she failed. The exquisite city of Lucca is famous for its romanesque architecture, for one of the best restaurants in Italy, and for being the birthplace of Giacomo Puccini (1858-1924), whose 250th anniversary has been noisily celebrated all over the world. The city now has another favourite son, Pompeo Batoni (1708-87), not that is has seemed to care very much about him hitherto. With a spectacular exhibition (6 December 2008-29 March 2009) in honour of Batoni’s tercentenary all that has changed. The show, in the restored Palazzo Ducale, was an unequivocal triumph, to the relieved amazement of the organizers, the city fathers and the regional government, all of whom had plenty to lose: because it was the first art exhibition on this scale ever mounted in Lucca. This act of faith – really, a leap in the dark – was amply rewarded, with hordes of visitors, major international attention and press coverage and, no doubt, economic benefits for the fine chefs and hoteliers of this enchanting town. Furthermore, the exhibition was bigger, better, and set in more splendid surroundings than in its previous venues. At the Museum of Fine Arts, Houston (21 October 2007-27 January 2008), it was very well displayed and accompanied by a good conference. At the National Gallery in London (20 February-18 May 2008), in contrast, it was rather cramped, insufficiently supported by proper educational initiatives and as a consequence rather poorly attended. All of this suggested a failure of nerve on the part of the gallery, which let down the outstanding work of the curator, Edgar Peters Bowron, whose lucid and civilized catalogue is a model of its kind and looks set to remain the most appealing guide in English to this attractive although ultimately elusive painter. In London, a conference was only finally mounted thanks to the Paul Mellon Centre for Studies in British Art. In Lucca, the vast spaces of the Palazzo Ducale were cleverly articulated by discreet design while affording plenty of room to display many of the huge altarpieces and allegorical canvases that formed as large a part of Batoni’s output as his well-known Grand Tour portraits. The exhibition, which had a separate catalogue edited by Liliana Barroero and Fernando Mazzocca, with contributions by others including Bowron, made some efforts to set Batoni within the traditions of pious ‘arts and crafts’ from which he emerged. This was rather canny, since Batoni was occasionally capable of straying into cloying religiosity (The Blood of the Redeemer at the Gesù in Rome was mercifully not on display), and he himself embodied the most active piety with evident delight in the pleasures of the flesh (in his personal life as well as his paintings), a combination that almost defines the High Baroque. It is hard to believe there was ever a more accomplished draughtsman than Batoni, and there was a small but satisfying selection of sketches on view, including several from Eton, one of which, ‘after the Antique’, shows a satyr with a graphically detailed full-frontal erection. Whatever it has done for boys or beaks over the years, in the context of quite so many glorious nudes it was tempting to see this drawing as in some sense a self-portrait. The Lucca exhibition also suggested the pan-European extent of Batoni’s clientele. Some of this material can make the modern viewer wince, notably the full-scale micromosaic re-working, ordered by Clement XIV for the Empress Maria Teresa, of Batoni’s oil of The Emperor Joseph II and his brother (cat. 66, 67), but it was quite right to show the two in unnerving contiguity. And there were many, many unequivocal treats on view, including the Bacchus and Ariadne (cat. 81) commissioned in a moment of chutzpah by Sir Watkin Williams-Wynn as a confronto to go with a Perseus and Andromeda from Anton Raphael Mengs then in Spain (the Mengs was stolen by the French en route and sold to Catherine the Great, and so the confronto was frustrated). Time and again, similarities to contemporary French academic painting came to mind, and perhaps the model in Batoni’s Martyrdom of St Bartholomew of 1749 (cat. 30) was even identical with that employed for Joseph-Marie Vien’s sole essay into the unconventional, his Sleeping Hermit (Louvre) painted in Rome in 1750. This is an exhibition about the man who invented those houses. English aristocrats making the Grand Tour of Italy in the eighteenth century were stunned by the country villas that Palladio had created on the mainland near Venice. The visual impact of this show makes you appreciate how it happened. Huge models of his villas, churches and palaces, many cut open or hinged in sections, are in every room. And so, if like me you find plans and elevations tricky to imagine as the finished article, the work has been done for you. Palladio’s drawings are things of unimaginable beauty in themselves. There are also glorious paintings by the likes of Canaletto, El Greco and Tintoretto to make this a feast for the eye as well as the imagination. Palladio was the first person to marry the forms of classical architecture with the country house. Until Palladio came along, they were just big farms. Suddenly, these working estates reflected the graceful palaces that noble families had become accustomed to in Venice and Vicenza. Palladio designed those too. 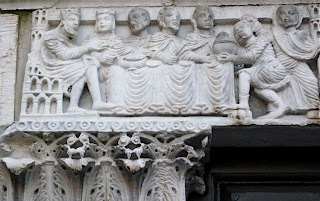 When they went to church on Sunday, they entered his adaptations of Roman temples. Or visiting the town hall, they would find themselves staring in wonder at Palladio’s transformation of a muddled medieval market into a public building straight out of ancient Rome. This is the astonishing Basilica in the centre of Vicenza, and a vast model in this exhibition shows how Palladio’s genius turned it into a vision of harmonious proportions. He cheated, by fiddling the dimensions of the openings so that the wonky streets inside the market appear to be aligned.